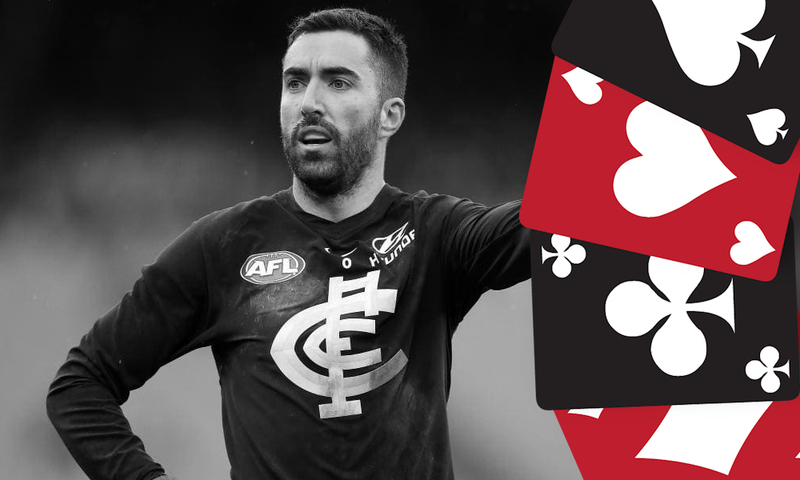 Mr Consistency and durability himself, Kade Simpson has been a mainstay in our Fantasy backlines for many years. Can he do it for another? Let’s break down some stats. Last year Kade Simpson or “Simmo” played his 300th game. He has been a model of consistency and remarkably durable for his entire career. He broke into the 22 in 2006 as a permanent member, and he has only missed 6 games since, of that rested for only 1 game last year. He assumes Carlton’s record for consecutive games with 162. So, we have a defender who basically never misses games, and has averaged 90+ since being a permanent member of the team. If you just count his last 3 years as a veteran his average is 98. And there doesn’t appear to be any reason to assume this veteran player is slowing down, he still sets the preseason standards at the carlton football club in his 17th pre-season campaign. Simmo is well known in the DT community as the “junk king”. When the game is well and truly over, and Blues play a bit of kick to kick in the backline in the last quarter, defence stewart Simpson collects plenty of +6’s, and I can’t see why this would stop. His ceiling is high for a defender and sometimes he junks up massive scores, in 2018 he scored above 120 5 times with a highest score of 131. He might not get as much of a boost from the new kick in rules as other defenders (he likes to kick the ball to himself) but he does frequently take kick ins and will receive a nice lil bonus to his already decent average. Simmo at this stage remains a good chance to be a top 6 defender yet again. Simmo is a veteran. He is 34 years old. This always scares away many coaches. Is this the season he gets old man calves? Will the Blues start resting him more? Will he simply start slowing down? Will a young buck take over his role as marshall down the back? Unfortunately star players do eventually start slowing down, having their roles changed, and get rested more at some point. This a small but important risk to be aware of. Simmo can also play some stinkers. Last year he had scores of 60, 61, 69, 66 as well as a couple in the 70s. His price tag of $692,000 is very hefty, and with the new kick in rules a lot of other cheaper defenders are more popular. This is reflected by at this stage only a 4% overall ownership. He will be a very popular upgrade target by coaches hoping his pricetag will drop. KING – I still rate Simmo as a King. He is the Junk King after all. The guy is DT Royalty. His preseason is going great by all accounts and he is full steam ahead and looking no different to his last few years. I don’t think this is the season that Simmo’s age will catch up with him. The Blue’s need him as a leader in the blackline once again to help lead their young team. I expect more junking this year, and with low ownership he’ll be a handy POD. I do agree that not starting him, hoping he starts slow and looking at him as an upgrade target is a good strategy. What do you consider Simpson as? That’s a pretty average comment DP. Everyone’s entitled to their opinion and there’s no need to be racist.